What does the Seventh Avenue Bridge mean to you? The old 7th Avenue bridge that has served the Maylands community faithfully since 1913 will be demolished in May, to be replaced with a new bridge that will offer all the functionality of the old one (plus some extras like a better footpath/cycleway) but without the personality of the old one. A significant public artwork is being commissioned alongside the redevelopment of the bridge to embody a memory of the site. The briefing for shortlisted artists is taking place tomorrow and Creative Maylands has a chance to contribute information to the public artwork briefing process. People seem to have a fondness for the old 7th Avenue bridge. It’s a repository for many memories, among older people and young people alike. We want to give you a chance to tell us what the 7th Avenue bridge means to you. We’ll collate all the responses we receive and pass them on to the shortlisted artists as part of the briefing process. It will then be up to the artists as to how they make use of the information we provide. You’ve got just 24 hours to put some thoughts to screen. Tell us in 3 words of less. Or a short paragraph if you’ve got more to share. Thoughts welcome until 10am Wednesday 26th March 2014. 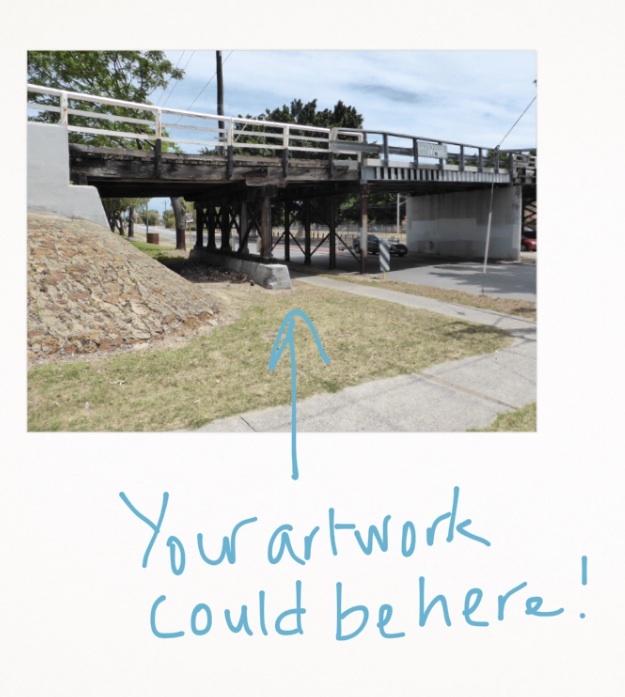 Main Roads WA is inviting Expressions of Interest from artists for a public artwork to mark the Maylands 7th Avenue Bridge replacement project. APPLICATION INSTRUCTIONS AND MORE INFORMATION: The Artwork Brief is to be requested directly from the project’s Art Consultant, Adrian Jones, by sending an email to lequeu@iinet.net.au with your contact details and the request: “Bridge Brief please”. We think the Maylands community deserves a truly awesome public artwork to do justice to the memory of the bridge and to help bring life to the streetscape of our town centre. If you think you’ve got what it takes to deliver the goods, get cracking with your EOI! Markets are fantastic gathering places for communities and are vibrant cultural spaces that support the exchange of goods, services, creative ideas, and different ways of life (think food, music and so on). They are well known for catalysing local economic development and revitalising public spaces. In recent years we’ve witnessed a revival of market culture in Perth, mirroring trends that are happening nationally and overseas. You can imagine our excitement when we heard that plans are afoot to start up markets in our neighbourhood of Maylands – yay! The Maylands Lions Club has recently been granted approval by the City of Bayswater to run a weekly hawker style twilight market on Saturdays from 4.30 to 8.00pm on the grassed area between the RISE and the Maylands Hall. The market will initially run from January to April 2014, with Saturday 25 January the anticipated kick off date. The market will feature quality gourmet food providers in a family-friendly environment, including local entertainment and interactive activities. Picture this empty space buzzing with people. The market is a fundraising initiative for the Maylands Lions Club, so any proceeds from managing the markets will be channelled back into supporting local activities – that’s a double win for Maylands! Volunteer your time and talents to help the Maylands Lions Club manage the markets. Local entertainer? Creative type with ideas for how to make the market space fun and engaging? Good with marketing or social media? Keen to get your hands dirty with set-up and all things logistical? All offers of assistance are welcome. Email Maylands Lions Club to get involved. Turn up and enjoy. Rock along to the markets for your weekly fix of community vibe! Where else but Maylands would you spend the month of May? Autumn feels like it’s finally upon us and every month there seems to be a new cultural event or activity popping up in our neighbourhood. 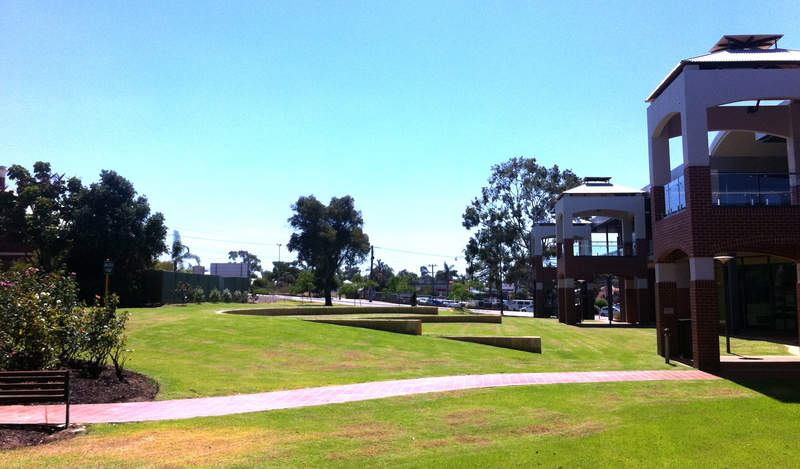 It’s a lovely time to be exploring all that Maylands has to offer. Have you ever thought about what makes Maylands unique and have ideas and opinions about how to keep it that way, or change it for the better? Saturday 4 May @ 2pm – A walking/storytelling tour of Maylands as part of the global event ‘Jane’s Walk’ that builds on the legacy of Jane Jacobs. Full details here. 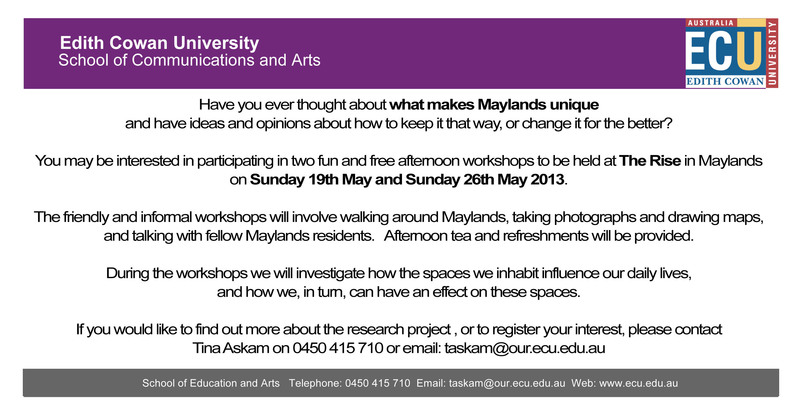 Sunday 19 May – A fun and free afternoon workshop involving walking around Maylands, taking photographs and drawing maps, and talking with fellow Maylands residents. Details here. Sunday 26 May – A second workshop (details as above). To keep up to date with the What Makes Maylands research project check out the facebook page, email Tina or phone her on 0450 415 710. Step Back in Time: Children’s Dance Theatre classes presented by Maylands-based BizArts Productions. Be a part of the WA Heritage Festival and join in with 2 school holiday workshops and experience some Maylands history. Come and have some fun learning popular dance moves, creative dance, drama games, mime, and play building. Where • Estudio Nuevo 2/306 Whatley Crescent (circa 1898). Cost of 2 day course is $60.00 per child. For bookings email Angela Perry or phone 0431 939 304. You’ll find full details of the WA Heritage Festival program here. We’d love to see more Maylands events in next year’s festival. Maylands Street Festival is THIS SUNDAY! The Maylands Street Festival is happening this Sunday 25th November from 10am to 3pm! If you’re looking for a place to relax and soak up the festival vibe, Creative Maylands will be setting up a vintage-style street picnic space in Lammy’s car park (next to the Old Bakery Cafe on 8th Avenue) for everyone to enjoy. 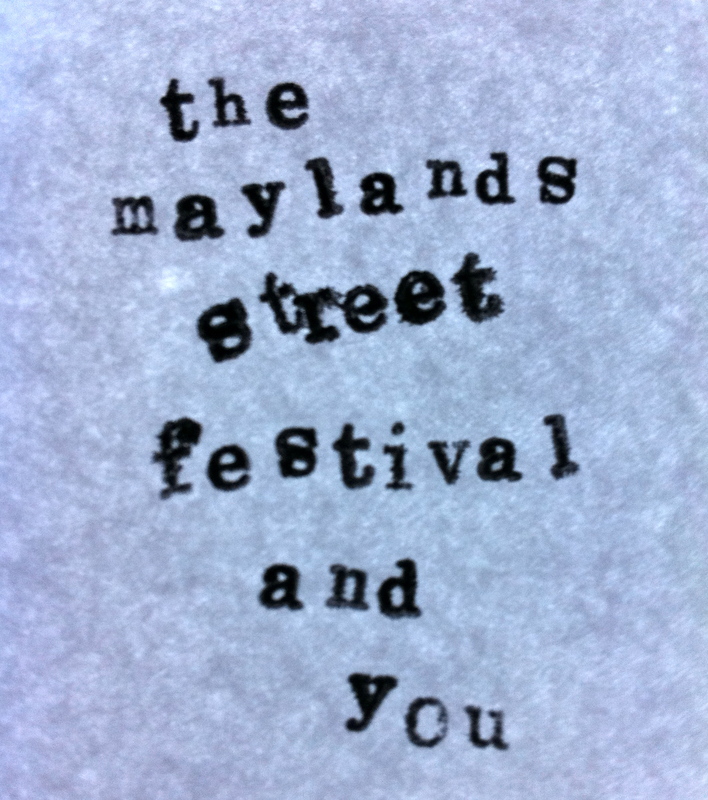 Maylands Street Festival 2012 – How to Get Involved! Sunday, 25th November – mark the date in your calendar because our neighbourhood is having a street festival!!! Some additional sponsorship has been secured so the festival is now full steam ahead and YOU can help play a part in bringing the festival to life. A vintage-style ‘street picnic’ themed meeting place where people can hangout and relax during the festival. A creative installation, with a Maylands flavour, that brings extra colour, life, joy, or intrigue to the street festival. Weeks 1 to 3 Developing up the ideas, identifying the resources/connections we’ve got to draw on, and working out what’s feasible within the 7-week timeframe. Weeks 3 to 7 Bringing our ideas to fruition, having lots of fun along the way! Creative Maylands will be hosting a number of co-creation sessions over the coming weeks – come and play! If you’ve got time and energy to contribute, want to meet a bunch of fellow Maylanders and Maylands enthusiasts, have a lot of fun, and make the festival your own, join us for Co-Creation Session #1. If you can’t make the first session but would like to be involved, drop us an email or message via facebook to let us know your interest. Join us for the first in an ongoing series of semi-regular GetTogethers that Creative Maylands will be hosting over coming months. This is a casual networking event for Maylanders (and Maylands enthusiasts) with an interest in creativity, cultural development, and place making who would like to connect, share ideas, and explore collaboration possibilities. Each event will include a PROFILE segment (showcasing the work of a local creative) and a PITCH segment (people pitching ideas for local initiatives and projects). Look what we have booked for this first GetTogether! Check out this exciting new art space that’s opened in Maylands and hear from Chrissie and Jonathan about plans for the space. The biennial Maylands Street Festival is coming up on 4 November. Angela Perry, from Maylands-based Biz Entertainment and the Festival Organising Committee, will fill us in on plans for the festival and we’ll explore possibilities for making a contribution to the festival. Coffee, tea and nibbles provided. BYO wine if you’d like some, we’ll provide glasses. RSVP via the CM facebook page or via email. We are looking for people to be part of the PROFILE and PITCH segments at future GetTogethers and local venues to host an event. Please get in touch if you’d like to be involved.